This clinic is for backcountry skiers and riders who want to spice up their backcountry adventures by covering more terrain and summiting peaks. 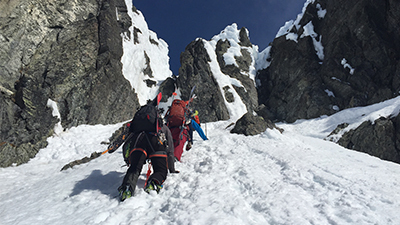 Learn to approach common ski mountaineering challenges systematically. Hazard recognition and management, risk management, anchor building, rope descending and ascending, entering a couloir and complex glacier travel will all be introduced. This course is 6:1 participant: instructor.